The companions of Stanley of Bickerstaffe Chapter No 3511 and their many guests, held their installation convocation at Ormskirk Masonic Hall and for this occasion the chapter was honoured by the presence of Malcolm Warren as the representative of the Grand Superintendent Tony Harrison. For the meeting Malcolm was accompanied by the Ormskirk and Bootle Group Vice Chairman Malcolm Alexander. Pictured from left to right, are: Malcolm Warren, Peter Hoyles, Ian Tupling and Malcolm Sandywell. The meeting commenced with the first principal Mike Sheron opening the convocation, with his companions Ian Tupling the second principal and Peter Hoyles the third principal. Once the initial business had been completed the chapter DC, Gregory Pinnington, announced that Malcolm Warren was without and sought admission. Malcolm was then brought into the temple in a procession, accompanied by Malcolm Alexander. 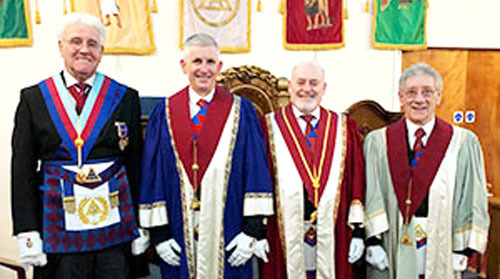 After Malcolm had been warmly welcomed by the three principals to the chapter, the installation ceremony commenced with the companions of the chapter and visitors being treated to an excellent and faultless ceremony, where they saw Ian Tupling, Peter Hoyles and Malcolm Sandywell, being installed into the three chairs respectively. The scarlet robe address was presented by Tony Prior; the purple robe address was delivered by Mike Sheron and the blue robe by Gary Evans, all the address where delivered in a confident and superb manor. At the conclusion of the ceremony, Malcolm brought the greetings and congratulations on behalf of Grand Superintendent Tony Harrison, congratulating the three principals, saying: “The Grand Superintendent hopes you have an excellent and enjoyable year in office.” Malcolm then went over to the outgoing first principle Mike Sheron and thanked him for all his work in his year in office and for the way he had installed Ian into the first principals chair. Malcolm then proceeded to thank and congratulate all the members of the chapter who had been involved with the ceremony on Tony’s behalf saying that it had been an excellent and enjoyable ceremony. Following the convocation, the members and guests retired to enjoy the delights of the festive board, were the diners had albondigas (Spanish meatballs) as the starter, which was followed by confit duck leg and boulangère potatoes as the main course, this was followed by cheese and biscuits. During the festive board a raffle was held which raised £112 which will be donated charities at a later date.